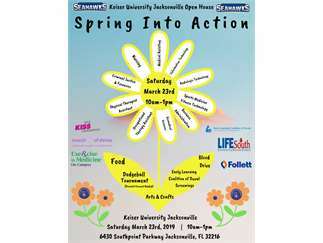 Spring into Action and March into Your Future at the Keiser University Open House! Saturday March 23rd, 2019 | 10am-1pm | Keiser University Jacksonville<6430 Southpoint Parkway Jacksonville, FL 32216Bring your friends and family to our open house to learn more about our Associate, Bachelor, Master, and Doctoral Degree Programs. Activities includeDodgeball Tournament (parent signature required)Free food-Blood DriveMusic by 97.9 KISS FM-Arts & Crafts for all age Early Learning Coalition of Duval providing free developmental screenings for childrne Visit each of our programs tables for more information>Programs include: Business, Nursing, Medical Assisting, Sports Medicine and Fitness Technology, Radiologic Technology, Information Technology, Occupational Therapy Assistant, Physical Therapist Assistant, Criminal Justice, and Forensics.Keiser University - We put our "Students First"